The Chartreux might well be compared to a mime, silent but communicative and sometimes silly. See all Chartreux characteristics below! The Chartreux typically weighs between 7 and 16 pounds. The Chartreux might well be compared to a mime, silent but communicative and sometimes silly. Short playtimes interspersed with naps and meals are his idea of the perfect day. When he is not displaying his superb timing and pouncing ability, “killing” toys with abandon, or performing acrobatic flips as he chases a lure toy, he is an attentive and gentle companion who likes to stay near his people and observe their doings. He appreciates any attention he receives, especially if it involves scratching him beneath the chin or between the ears, but he’s not demanding, content to follow you around devotedly, sleep on your bed and snuggle with you if you’re not feeling well. He rarely uses his voice, preferring to direct your actions with a glance from his pumpkin-colored eyes. If need be, however, he may communicate with a small meow or chirp. Make a habit of observing him carefully and being familiar with his actions since it is unlikely that he will vocalize any discomfort or make any sound to let you know where he is. This is an adaptable cat with a middle-of-the-road personality. He’s not a social butterfly, but he’s not a shy wallflower, either. Expect him to watch and wait before deciding whether to greet a guest or otherwise involve himself in a situation. His calm nature makes him suited to staying home alone while you are out earning the money for his treats and toys, but he won’t object to keeping company with another cat or dog. That same good nature makes him a good travel companion for an RV enthusiast or long-distance truck driver. As long as you keep his routine similar each day, he will be a happy camper. The Chartreux has a sunny, polite disposition that makes him a pleasure to live with. This is one cat who does his best to obey the rules. Always treat him kindly and patiently, and you will be rewarded with a friend for life. Both pedigreed cats and mixed-breed cats have varying incidences of health problems that may be genetic in nature. Chartreux are generally healthy, but the following problems have been seen in the breed. Patellar luxation is a hereditary dislocation of the kneecap that can range from mild to severe. Mild patellar luxation rarely causes problems. Severe cases cause lameness, but can be alleviated with surgery. The Chartreux’s short, thick coat is easy to care for with weekly brushing. The coat sheds in the spring and may require extra brushing during that time. A bath is rarely necessary. If your Chartreux does require a bath, remember that it can take time to get the water-repellent coat wet enough for bathing. Brush the teeth to prevent periodontal disease. Daily dental hygiene is best, but weekly brushing is better than nothing. Trim the nails every couple of weeks. Wipe the corners of the eyes with a soft, damp cloth to remove any discharge. Use a separate area of the cloth for each eye so you don’t run the risk of spreading any infection. Check the ears weekly. If they look dirty, wipe them out with a cotton ball or soft damp cloth moistened with a 50-50 mixture of cider vinegar and warm water. Avoid using cotton swabs, which can damage the interior of the ear. Keep the Chartreux’s litter box spotlessly clean. Cats are very particular about bathroom hygiene. It’s a good idea to keep a Chartreux as an indoor-only cat to protect him from diseases spread by other cats, attacks by dogs or coyotes, and the other dangers that face cats who go outdoors, such as being hit by a car. Chartreux who go outdoors also run the risk of being stolen by someone who would like to have such a beautiful cat without paying for it. 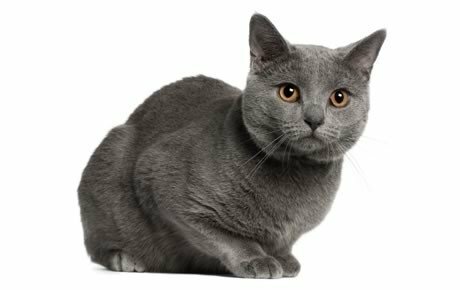 The Chartreux has the sturdy, powerful body of a working cat wrapped in a short, thick, water-repellent coat. Besides his beautiful fur, his most distinctive feature is his deep orange eyes, set in a rounded, broad head. He has full cheeks and a sweet, smiling expression. Medium-size ears sit high on the head. His body type is sometimes described as primitive, being husky and robust with broad shoulders and a deep chest. His relatively short and fine-boned legs rest on round, medium-size paws that look almost dainty. A lively, flexible tail is heavy at the base, tapering to an oval tip. Don’t let his ample body and solid muscle mass fool you. This is a supple, agile cat who typically weighs 7 to 16 pounds at maturity. Pick him up and you may be surprised by his heft. Chartreux grow slowly and males especially may not reach their full size until they are 4 or 5 years old. The medium-short double coat has a slightly woolly texture, which varies depending on the cat’s age and gender, as well as the climate in which he lives. For instance, mature males have the heaviest coats, while females or young cats may have a thinner coat or one that feels silky. The coat can be any shade of blue-gray. The tips of the fur look as if they have been lightly brushed with silver. Kittens may have the faint imprint of tabby markings (called ghost barring) or tail rings, but by the time they mature the coat should have a bright, even tone. Completing the look is slate-gray nose leather, blue lips, and rose-taupe paw pads. The tolerant and gentle Chartreux fits nicely in a home with children. He is more likely to walk away than to scratch if he doesn’t like the way he is being handled. Parents with young children should always supervise interactions to make sure the cat isn’t mistreated. He is happy to live with cat-friendly dogs, too, thanks to his amiable disposition. Introduce pets slowly and in controlled circumstances to ensure that they learn to get along together.